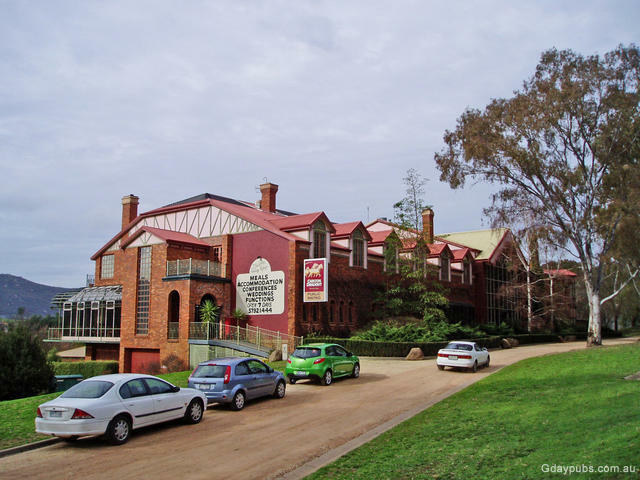 Visit some fine pubs heading north out of the Melbourne's eastern suburbs by going through the Yarra Valley winery area of Dixon's Creek to Yea and over Mt Slide. This can be a pleasant journey taking you to Seymour (on the Hume Hwy) or north east to Alexandra. 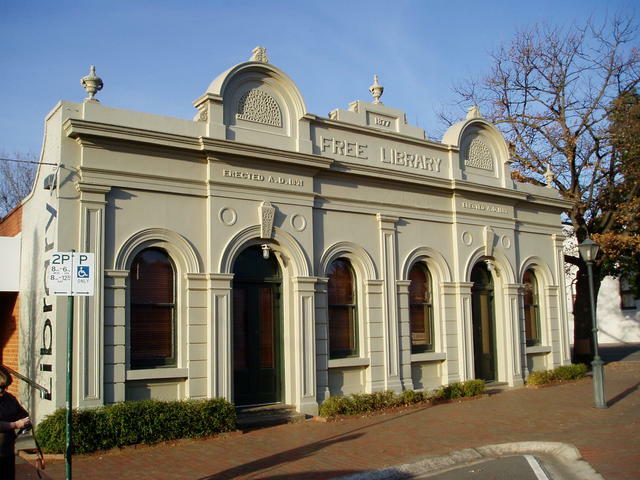 Lilydale, situated on the fringe of metropolitan Melbourne, is the gateway to many of the trails we recommend in the inner eastern region of Melbourne, Victoria. It permits access for a day's tripping around the beautiful Mount Dandenong Ranges immediately to its south. 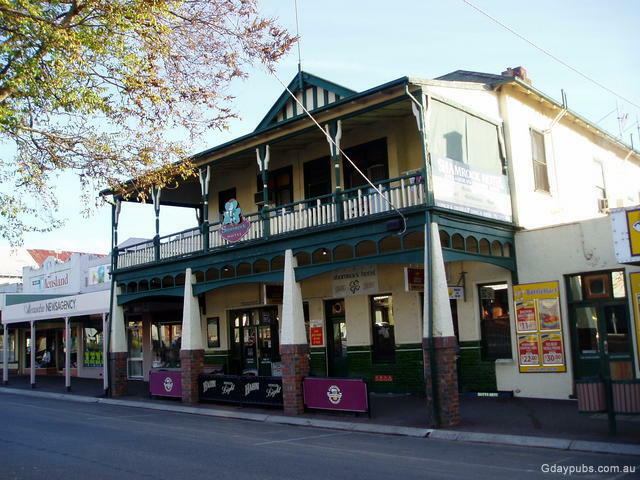 See The Dandenongs Pub Trail. 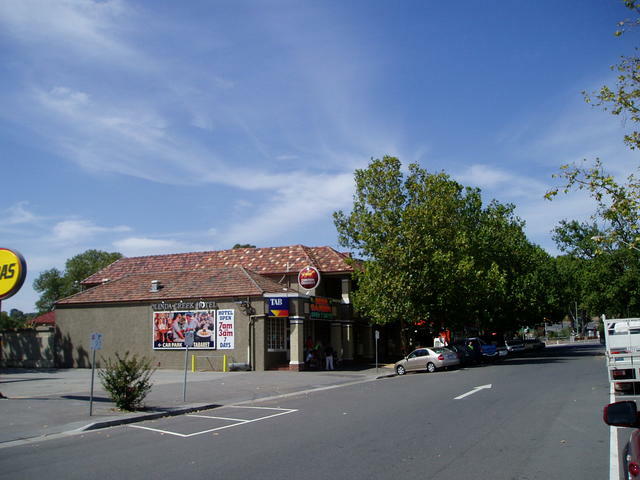 To the south-east of Lilydale, lies the approach to Yarra Junction, and beyong to Warburton and into the lower reaches of the High Country area towards Woods Point. 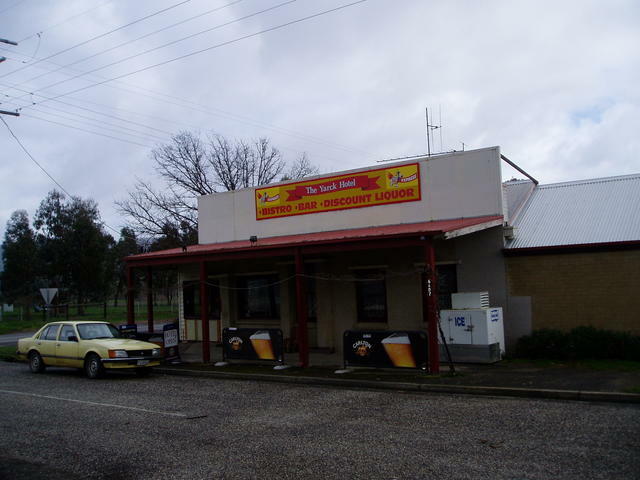 At a midpoint of the Warburton Pub Trail, it leads travellers further south into Powelltown through Noojee/Neerim way, and down to the Princes Hwy for escaping towards the treats of Gippsland. To the north east, there is The Spur, taking you through one half of the magnificent Yarra Valley to Healesville and up though tall timbers over Mt Dom Dom and up to Marysville/Lake Mountain and through to Alexandra, via Buxton and Taggerty. And there is this trail, leading you up north to Yarra Glen, through the second half of the Yarra Valley at Dixon's Creek and up through magnificent winding mountain roads, to Yea and also emerging at Alexandra. 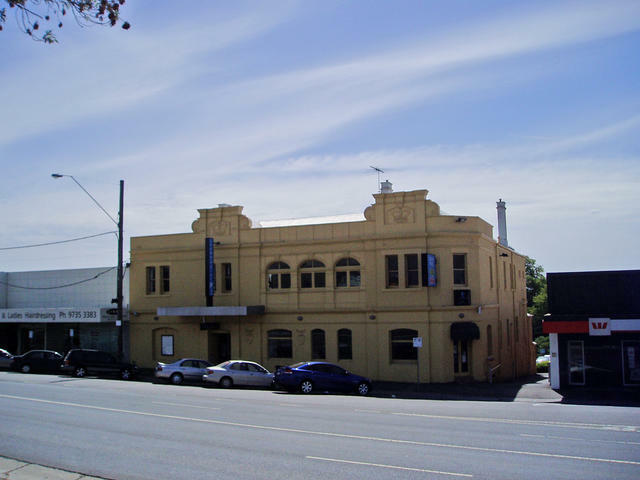 And of course, Lilydale is on the end of the main suburban rail link, so easy access is available to slip down to see our suggested Melbourne Pub Trail. It is an ideal place to centre yourself for exploring so much of what is on offer. This trail, the Mt Slide Pub trail, is well complimented by taking a return trip from Alexandra back to Lilydale via The Spur Pub Trail. 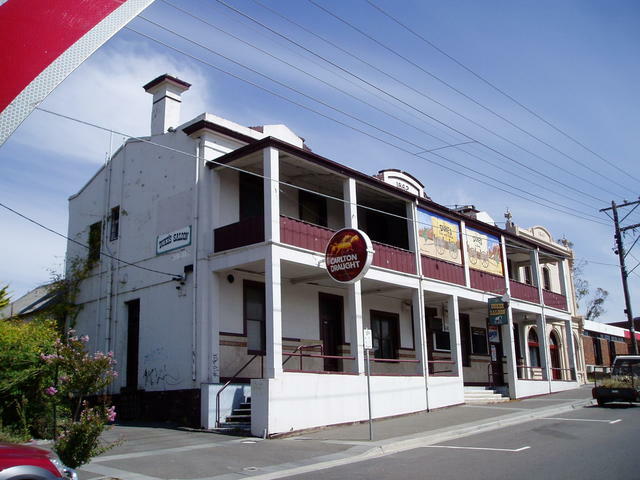 The Olinda Creek Hotel at the western end of town just as you enter past the railway. 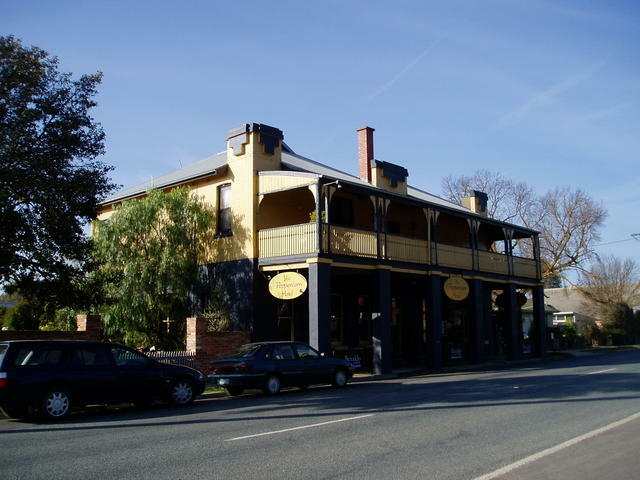 Yarra Glen - the town just sounds like it belongs to be part of a leading wine-making area. But there's more here than wine! 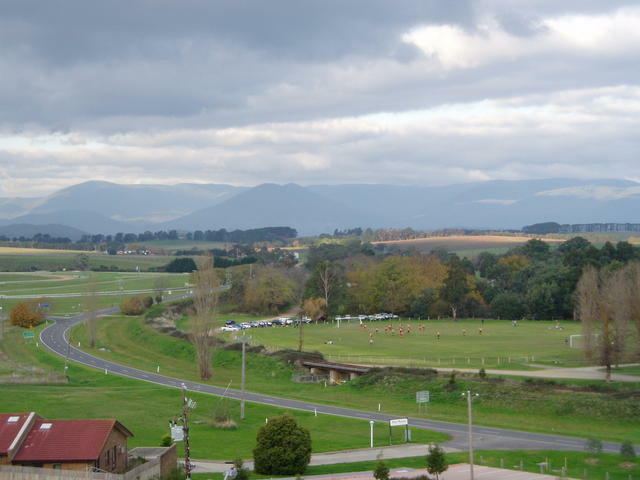 The town has an excellent racecourse, and what a great place to come and spend a few days when such events are on, and then finish it off with a run up though the nearby hills. The main street itself, has a number of interesting antique and craft shops, and of course there are the usual farmer's markets regularly in operation. On the northern exit from town towards Dixon's Creek, is Gulf Station, an historic icon depicting early farming in the area. 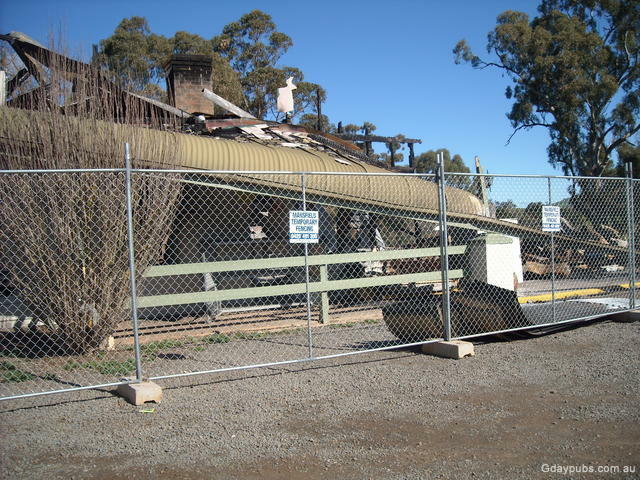 It is being restored by the National trust and Heritage Victoria, and opening times have been changed pending completion of those works - but the property can be seen from the street, on your left as you travel shortly towards Dixon's Creek. Enjoying the fruits of the area - bottled of course! 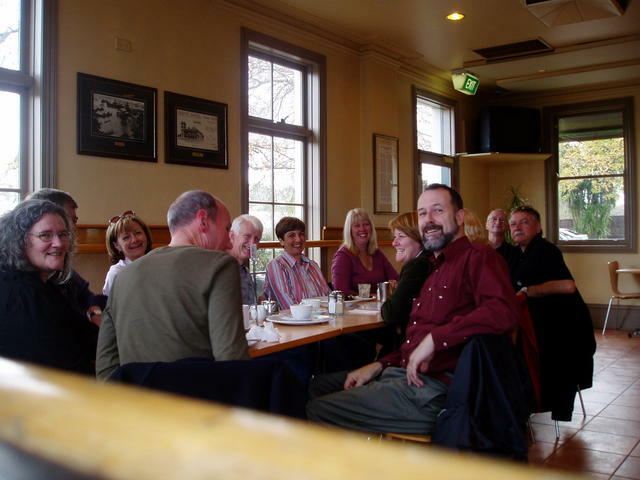 Yarra Glen Grand Hotel bistro... enjoying the company of friends before a great day in the wineries! tasting the treats of the Yarra Valley, doesn't come better than this - right in the middle of the two regions - with Coldstream to Healesville to the south-east, and Dixon's Creek yet to come - just up the road. The Yarra Valley is a top spot for taking a group out to do some wine tasting - but staying in the town for the night at a top Pub! 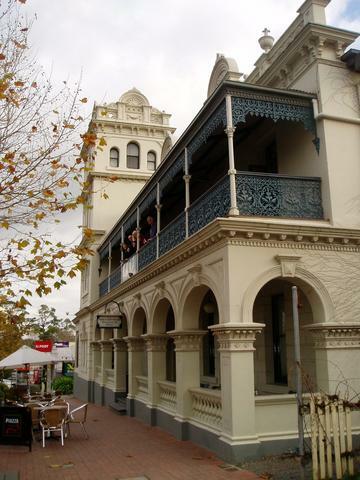 The magnificent Grand Hotel right in the centre of the main street of Yarra Glen, boasting its tower room where you can fetch a view over the entire valley area if you'd like to stay - or just admire the view from the balcony! 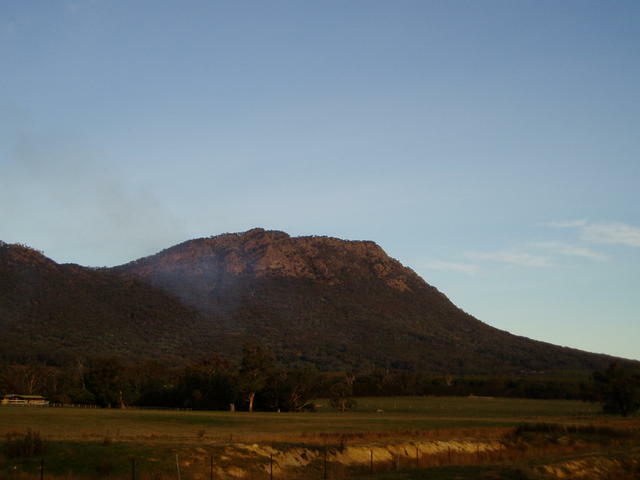 Between Yarra Glen, and Glenburn is Mt Slide and Dixon's Creek. 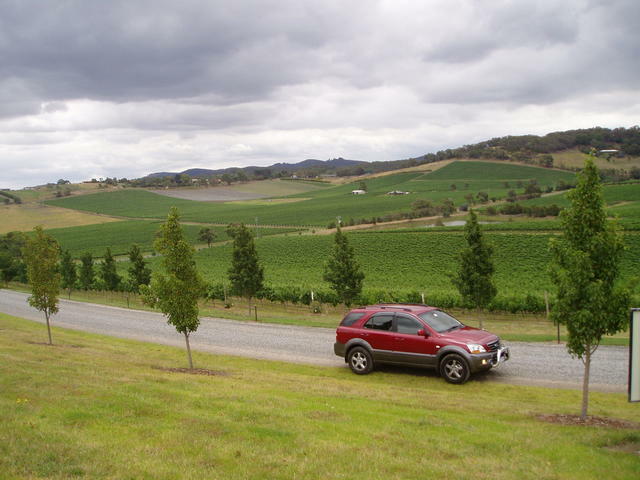 This area at the northern end of the Yarra Valley, before you climb up to the Toolangi crossroads at the top of the climb, is renowned for some of the best known and recognised wineries. 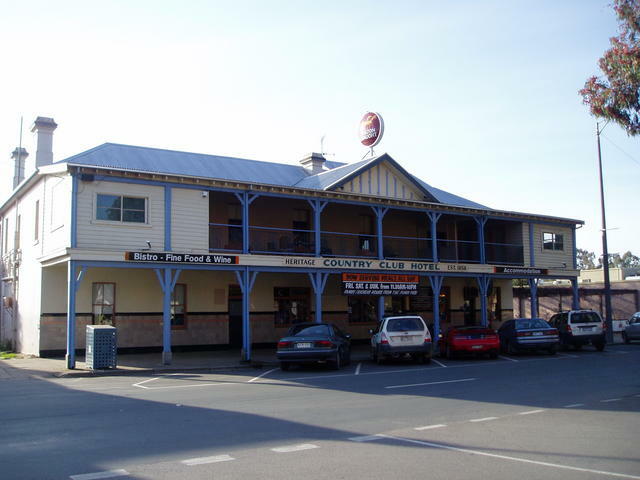 The Glenburn Hotel, well frequented by the locals of the region. 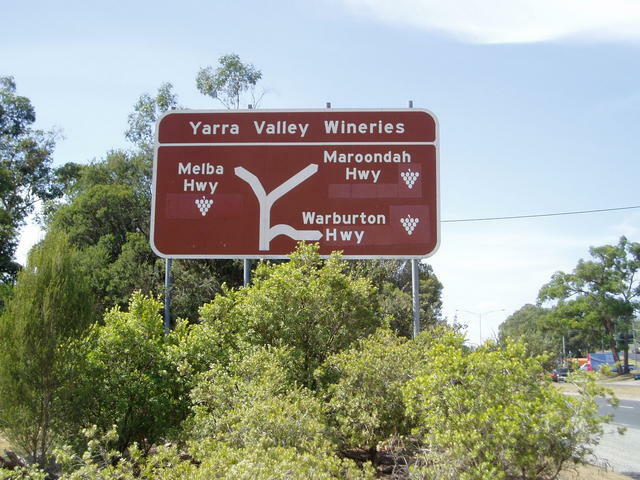 Yea - the junction where the Melba Highway meets the Goulburn Valley Highway. On any day, you can expect a full house in this town. 4WD's, caravans, campers and mobile homes, and a few semi-trailers making their way into the outer eastern suburbs south in Melbourne - they all stop in this town to fuel up with breakfast, lunch, or tea. It seems all roads lead here if you've been heading down from NSW or the northern regions of Victoria, and are heading back to the outer east of Melbourne. Whilst the Hume Highway has bi-passed so many towns around this region, and sure, the road is fast and flows, there's just nothing like getting back into the country town feeling of seeing the original way of getting through these parts, and Yea well hosts all those that come and stay a while rather than pass through. 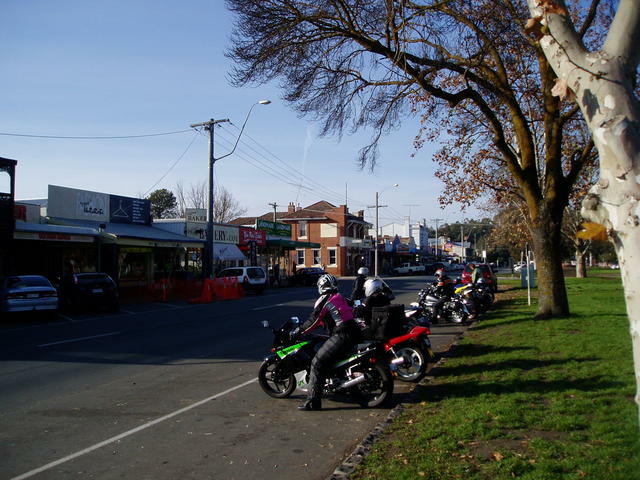 And on weekends, well, Yea is a real magnet for motorcycle enthusiasts, as they make their way from Lilydale to Yea just for the thrill of spin through Mt Slide, or they go for the double treat by doing the loop via Alexandra down through The Spur to Healesville and back into Lilydale that way, as we've described earlier. So give these chaps a slice of the road, because they really enjoy this region, and you will too. Some motorcyclists getting ready for another sunny day cruise through the hills - likely to have just made a pitstop at the local bakery! Grand Central Hotel, midway down the main street. The Royal Mail Hotel in the centre of town. A sideline trip can be taken, west from Yea, for those interested in heading out towards Seymour to jump onto the Hume Highway at that point, although it is fair to say, the more picturesque and quieter route is to push on through to Yarck an beyond, to link up to the Hume nearer to Benalla. The facade of the former Trawool Hotel still standing here, but now inside the actual foyer area of the current resort! A Pub in a Pub! Now that is something different! Now this is the original pub, down in the valley. Trawool is surrounded by hills and has a unique appearance, with bolders of all shapes and sizes perched on the surrounding landscape. 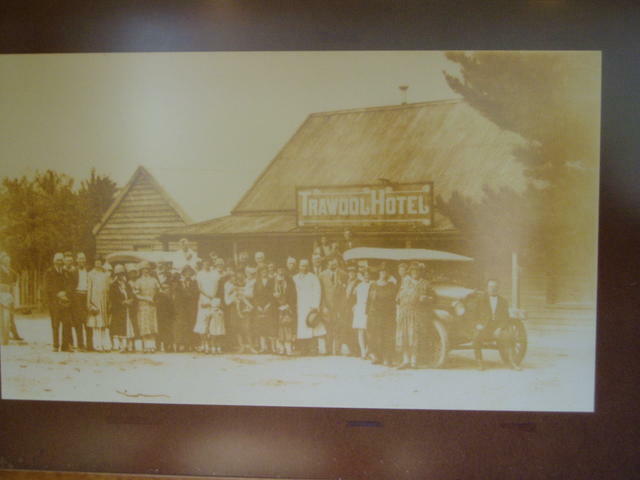 The township once boasted a Hotel closer down by the river in the valley, and another up by the present site, where travellers will be surprised to find that this hotel literally houes the original hotel - complete with outside facade! 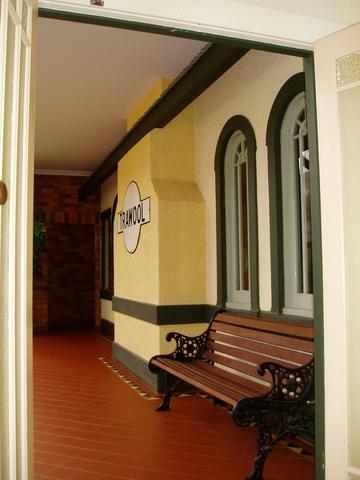 Trawool Valley Resort offers a range of accommodation and is secluded in a valley midway between Yea and Seymour, and well placed for travellers heading in/out of Melbourne towards Shepparton, onto the Hume or just wanting a place to unwind that is not that far out of Melbourne. Molesworth can sneak up on you if you're not careful. Before you know it, you round the bend into the town coming up from the south, and there's the Pub! A real typical one-pub town! So drop in and have a chat with the publican, and help him solve some more problems of the world with ou - you never know what you'll learn. There's no hurry here, you've a few miles to go to the next town, so how about stopping for a meal and break that journey a little. The hotel, with its motel facilities, is easy to find in this town. Its one of those pubs that you can just drop into and strike up a yarn with fellow travellers along the way - no hustle/bustle here, just downright good cold beer when you need one! Alright, the turnoff to Alexandra was just back there, wasn't it? But you wouldn't want to come up this way and not check out the township of Yarck would you? It's not out of your way. 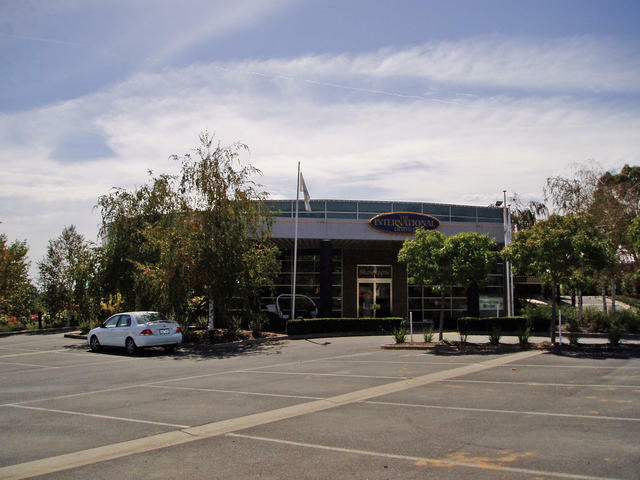 In fact, you may be considering heading on further north anyway, to reach the Benalla turnoff a little ways up the road at the Maindample turnoff. 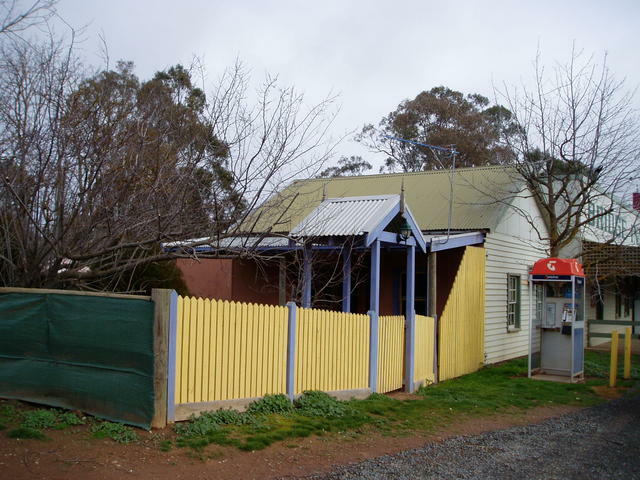 Or you may be using this Pub Trail to meander on up to Mansfield to check out the Snow Country at nearby Mt Buller. Either way, pop into Yarck, and if your destination of this trip, is in fact to Alexandra, just pop back down the road behind you again, and take a left turn to slip over to Alexandra. But watch that "left" turn - it is actually achieved by taking the RIGHT lane, which swings up and over the road south back down where you came from..... and then it heads you east. So keep your eyes on the road - there's lots more we want to show you! Yarck Hotel, towards the end of the main street at the northern end. Now here's a pub with a nice beer garden. Its the hospitality and fine welcome you get - that's the important thing when visiting great little pubs like this along your journey. You need to strech your legs don't you? 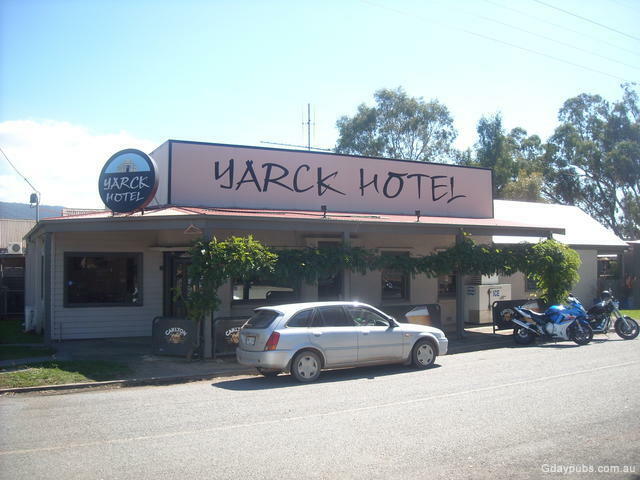 Well, hop on into the Yarck Hotel and find out what's going on! 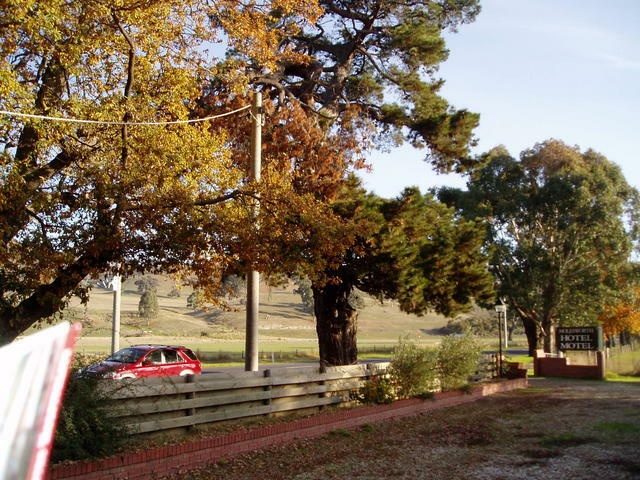 Although this Mt Slide Pub Trail is aimed at showing travellers a Lilydale to Alexandra route, this trail is the best way to reach the Hume Highway (Benalla exit) if you are looking for a scenic exit from Melbourne to central NSW. So we should mention Maindample. It is located just short of the major turn you need to make if heading up this way. 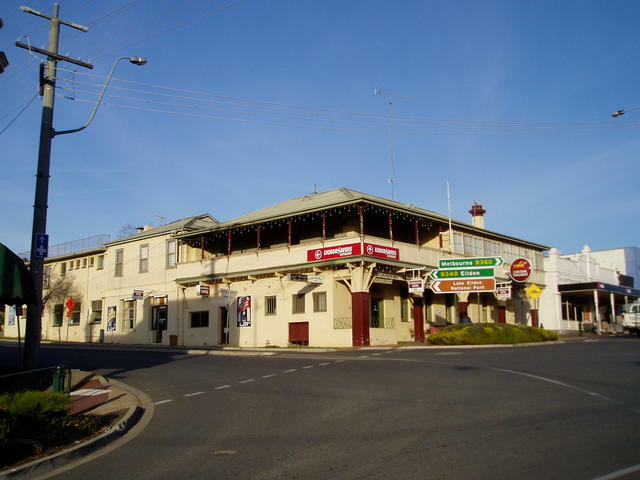 The Midland Highway is on your left as you head east from the pub, and that will lead you straight up to the Hume Highway (or into Benalla). The local pub has a great atmosphere, plenty of easy parking for big rigs, and a top spot for gathering around open fires in winter, that's for sure! 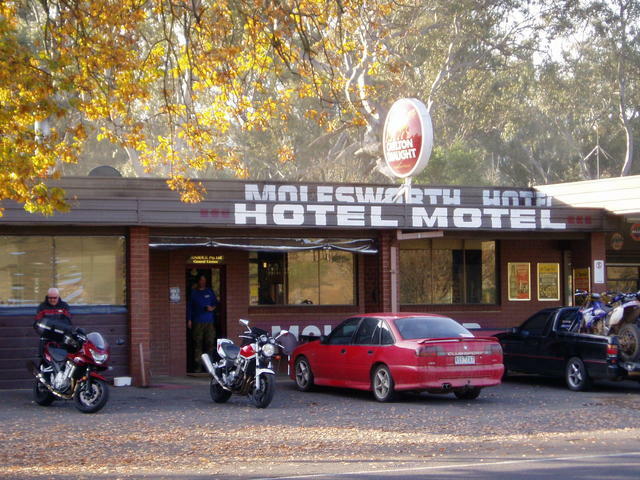 a couple of 'NSW locals' exchanging their travelling experiences in comfort of another fine Aussie Hotel. 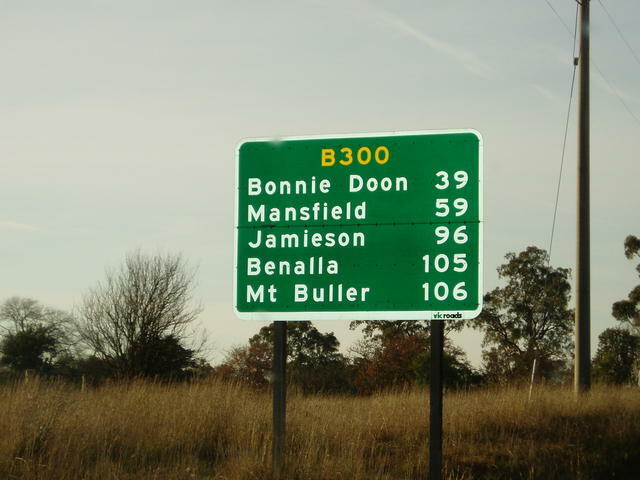 You should note, that the Hume Highway bipasses Wangaratta and Albury, so from Maindample, the next direct town you will pass on the Hume is pretty much Woomargama in NSW! Remember, our philosophy is to enjoy the journey, and not tear off to just a destination, so take it easy, and do a little more local exploration! 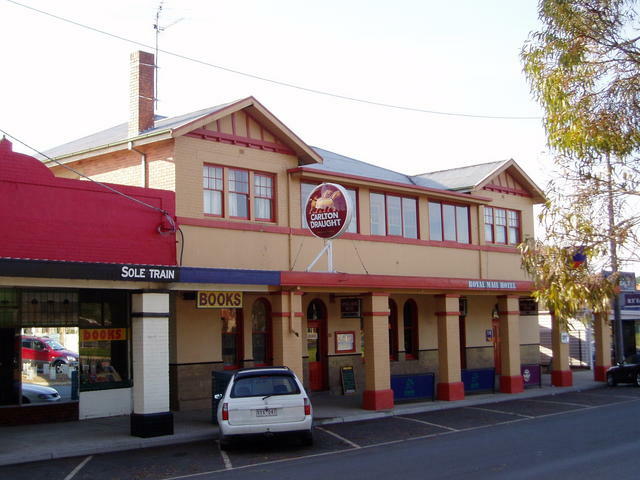 Last Pub before North Albury, if heading up the Hume Highway via the Benalla exit from here. Alexandra - a great town, it has the lot! 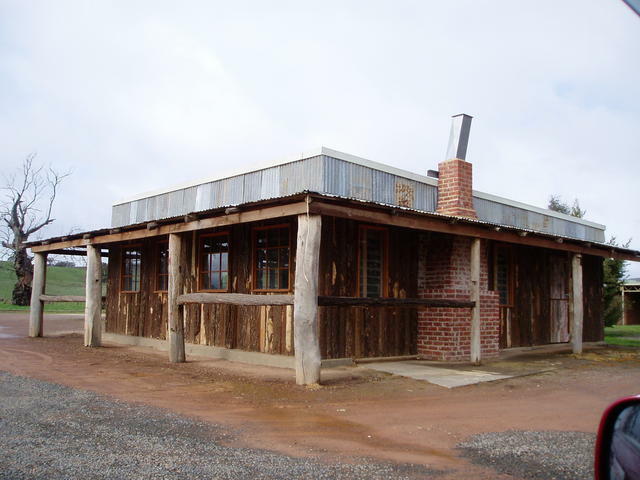 Make this a stop over for the night, so you can spend plenty of time checking out the many rocky outcrops, views and fine scenic drives on either the Mt Slide Pub Trail or The Spur Pub trail tomorrow or surrounding areas before continuing on the loop back. 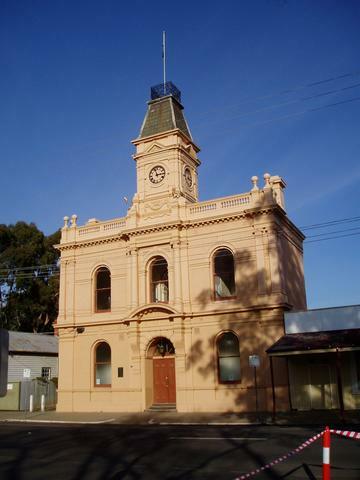 The western end of the town opposite the park boasts some great old buildings, and the historical records of the area are worth a look in this part of town. 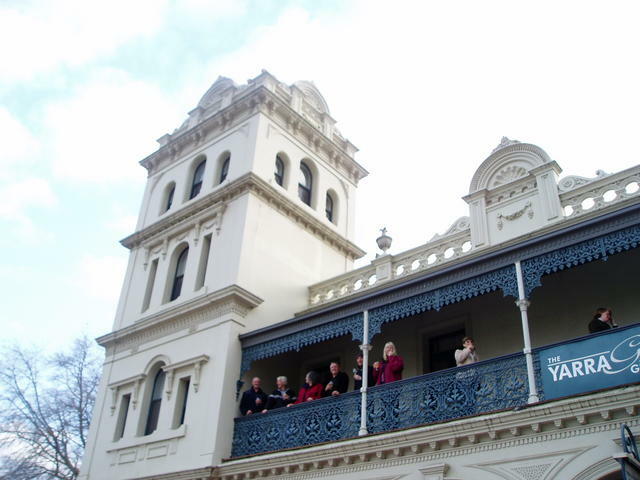 Alexandra is a top spot for branching back down to Lilydale in the south, or taking the Buxton turnoff out to Marysville and up to Lake Mountain further south. 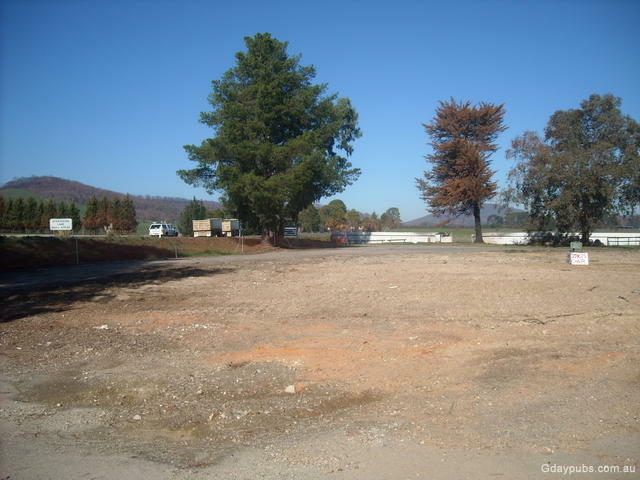 Then, there is Eildon just east of Alexandra, and Lake Eildon beckons those interested in boating, fishing or water sport. As for 4WD enthusiasts, well the fun is just about to start, as you consider the many tracks up around the areas nearby like the Rubicon Range, Mt Torbreck, Mt Terrible, or farther east to the areas of Jamieson, Gaffney's Creek and Woods Point. 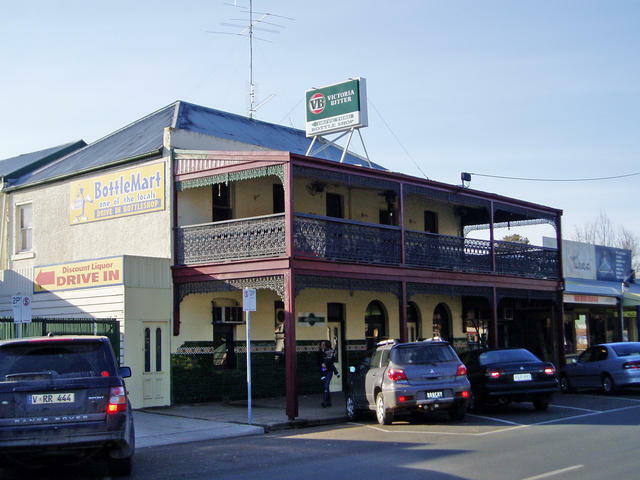 You can criss-cross a great deal of the Big River country here, and then join back up to our recommended Warburton Pub Trail to link back to Lilydale and Melbourne that way, if you've got some time on your hands. The Maroondah Highway, leading south out of Alexandra to Taggerty and Buxton leads you down to the Cathedral Ranges, a top spot for hiking and exploring. 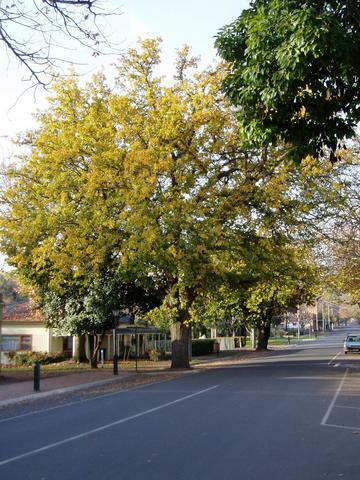 Typical scene from the magnificent tree-lined streets of Alexandra, around their gardens at the northern end of town. The substantial Commercial Pub is at the main cross roads in the middle of the town. 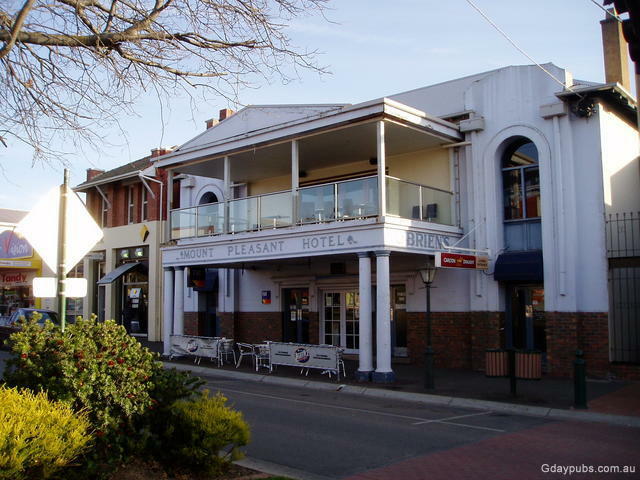 The Mount Pleasant Hotel - pleasant indeed it is! 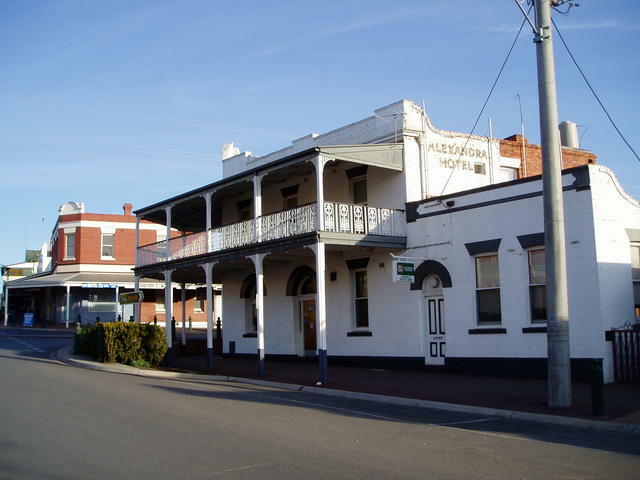 Bearing the proud town name is the Alexandra Hotel, also on the main cross roads in the middle of town.